An early stand-alone adventure by Cliff Johnson (The Fool's Errand) and Allen Pinero. 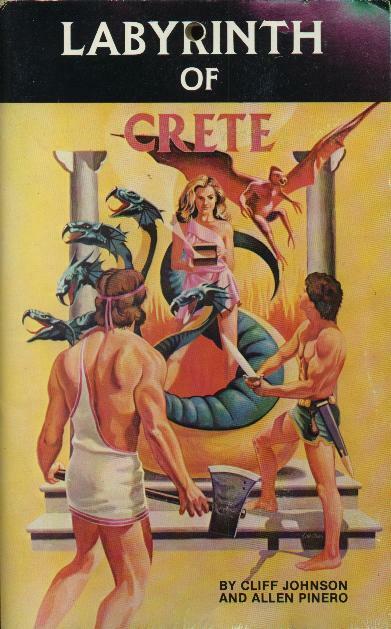 Labyrinth of Crete is set in ancient Greece and lets you control two legendary heroes, Hercules and Jason. The labyrinth is three levels deep -- a simple map is printed on the back of the package -- and Greek characters and situations abound. The game uses the same interpreter and split-screen setup as Scott Adams' classic adventures: Room descriptions, visible items and exit lists are at the top, with the command prompt at the bottom, separated by a dividing line. There are also some static graphics, a precursor to the S.A.G.A.S., drawn full-screen at appropriate points in the game.